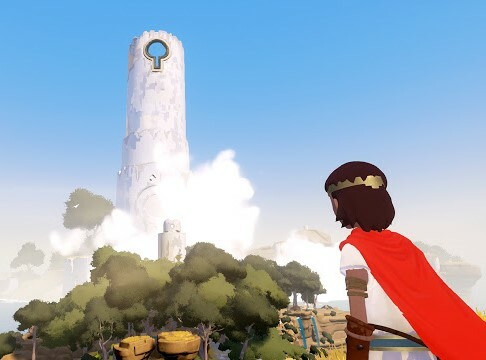 It’s easy to talk about RiME in terms of the pieces that make it up: its art style, vaguely reminiscent of Ico and Journey; its Uncharted-like climbing sections; its puzzles, that call to mind Tomb Raider and The Legend of Zelda. But to do so would be a grave disservice to the game, because it’s so much more than the sum of its parts. 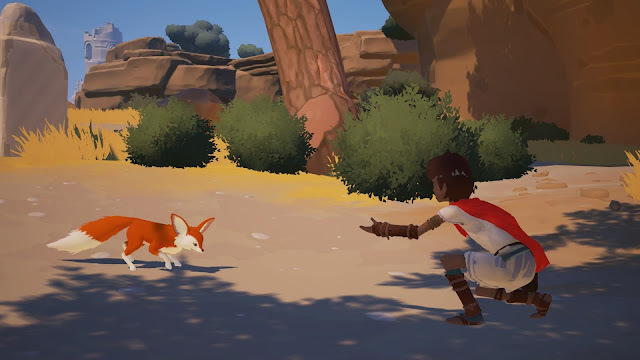 RiME is a deep and moving experience, one that feels familiar yet unique, comforting yet confronting, like your closest friend and your worst enemy – all at the same time. 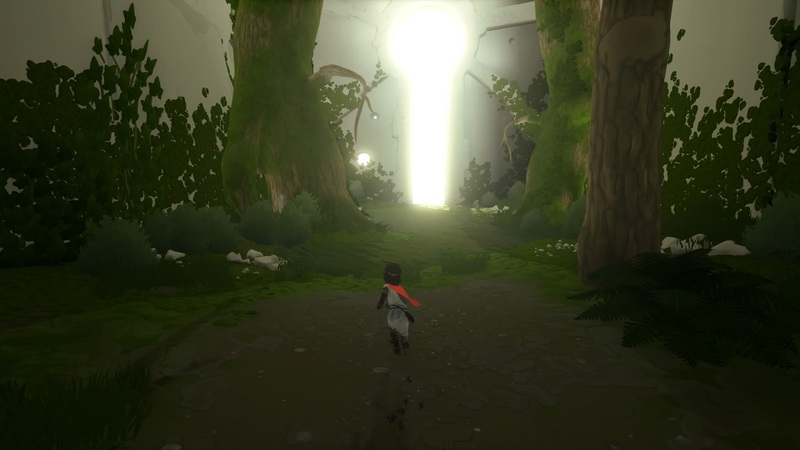 Related reading: RiME is superficially similar to Journey. Matt's full review. RiME begins with a young boy being washed up on the beach, with no explanation as to what happened or why he’s there. He’s a scrawny sort, garbed in humble rags but for one defining piece: a bright red piece of cloth draped from his neck like a cape. With little else to go on, the boy sets about exploring this little section of beach until you find your way up to the top of a nearby hill. Luckily, this lad is an agile sort, so he can climb cliffs and leap chasms as well as any Lara Croft or Chloe Fraser can. At the top of the hill waits a statue of a fox, glowing with a faint green light. With a shout from the boy, the light leaps out of the statue and dances its way across the fields, leading to a strange shrine with five similar statues: four small ones, and a giant one behind them. The light from before brings its glow to one of the four small statues, making the boy’s next task clear: find another three glowing statues, so that he might light the rest of the ones in the shrine and, presumably, activate something with the big one. So this young chap makes his away across a handful of crumbling ruins, caught in the slow process of being taken by nature, to find the remaining statues. He climbs precarious structures, and he picks and tosses peaches about to attract the attention of boars, that they might tear through brambles blocking his path. Every now and then, he stops to take in the sights from the top of his little derelict castle: the beauty of an ocean basking in the sun, the distant islands, a huge tower on the edge of the horizon. Before long, he’s found all the statues and sent their lights flying back to the shrine. The result of his effort is the appearance of an adorable little fox spirit, and with a little yap-yap-yap, the fox beckons the boy to follow. So starts an adventure that sees boy and fox travelling across this strange island, seemingly to reach that great big tower and climb its heights – though the reason remains a mystery. It’s a perilous journey, and to get to its end the boy must contend with wyverns and antagonistic spirits, and use his wits to solve puzzles of light, shadow, perspective, and time. He must brave sweltering deserts, dive to the depths of the ocean, and uncover the mysteries of an advanced civilisation lost to the march of the ages. He must climb the tower, in search of an explanation; in search of closure. It’s a beautiful journey, in both an aesthetic sense and an emotional one. Soft colours and simple designs give everything a dreamlike quality, perfectly fitting this surreal adventure. The boy’s companionship with the fox is a lovely one, not to mention the other friendships that form, which I dare not say any more about. In lieu of words, a phenomenal soundtrack does the narrative heavy lifting, perfectly selling every poignant twist and dramatic turn. 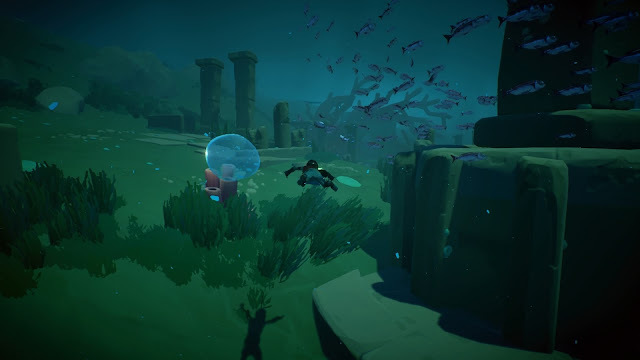 Without so much as a word, let alone exposition or an explanation of what is going on, RiME tells a story that runs the full gamut of emotion, from the joy of new friendship, to fear in the face of danger, to far darker feelings that I won’t say any more about. It’s an adventure full of parts that feel familiar, but that come together to create something unlike anything you’ve played before. It’s a beautiful thing to experience. Those past few hundred words might sound a bit vague, but that’s intentional. It’s in keeping with RiME’s own approach, but more importantly, this is a game that’s best experienced with as little prior knowledge as possible. 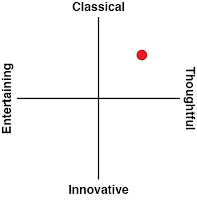 It’s a game to inspire awe and wonder, and that works best the less you know about it. However, the most beautiful thing about RiME is something I can’t even begin to talk about without at least hinting at a major plot detail. This is the thing that sets RiME apart from other “emotional games” like Journey, and it deserves to be covered in a review because it’s definitely the thing that takes this from simply being a very good game to one that’s truly important. 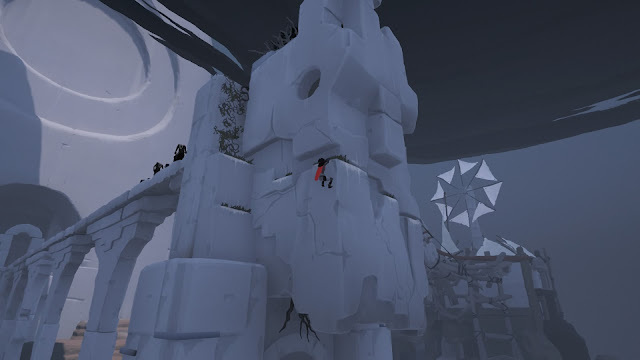 But consider this your spoiler warning, and please, if you’re at all interested in RiME, play it before reading on. The thing that makes RiME so much more than the sum of its parts is the subject matter it deals with: grief. RiME is a game about grief; a surreal journey through the process of grieving the loss of a loved one. The various environments that the boy and the fox travel through all represent stages of grief. The beautiful island, with its myriad of perspective-altering puzzles that have you “fixing” broken things by looking at them with narrowed vision – denial. A lengthy battle with the wyvern over an expanse of harsh desert and untamed ocean – anger. Delving into an ancient civilisation, and resurrection long-disabled automatons to aid in your journey – bargaining. Fighting your way through rain and sleet, with seemingly no end in sight and with companions by your side – depression. And, finally, ascending the tower that’s always been the goal of this journey, climbing to its top, and finding the treasure contained within – well, that’s acceptance. There are plenty of games that deal with death, from all different perspectives and ideologies, be it the black humour of NieR or the odd hopefulness of What Remains of Edith Finch. Far fewer games deal with what comes after death, for those left behind: the grief of losing a loved one. Anyone who’s ever been there will know what a difficult time it is, with so many different emotions all building up and boiling over, as you just try to hang on. Related reading: The Last Guardian is another arthouse game that fans of RiME should love. Matt's full review. 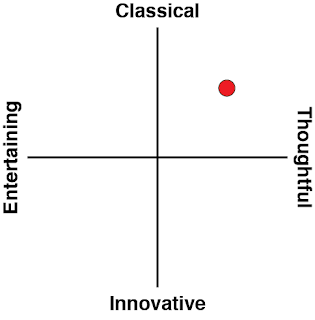 It’s that that RiME gets so right. It’s an interactive metaphor for grief, and all those strange, complex emotions that all seem get balled into one when you’re grieving. RiME is a beautiful game in so many ways, but this is what makes truly special.